A device that causes objects to burst into molecular pieces. You just can't resist the title. The novelist enlists the aid of the well-known inventor to solve the Martian problem. Acting upon the hint which had been conveyed from various investigations in the domain of physics, and concentrating upon the problem all those unmatched powers of intellect which distinguished him, the great inventor had succeeded in producing a little implement which one could carry in his hand, but which was more powerful than any battleship that ever floated. The details of its mechanism could not be easily explained, without the use of tedious technicalities and the employment of terms, diagrams and mathematical statements, all of which would lie outside the scope of this narrative. But the principle of the thing was simple enough. It was upon the great scientific doctrine, which we have since seen so completely and brilliantly developed, of the law of harmonic vibrations, extending from atoms and molecules at one end of the series up to worlds and suns at the other end, that Mr. Edison based his invention. Every kind of substance has its own vibratory rhythm. That of iron differs from that of pine wood. The atoms of gold do not vibrate in the same time or through the same range as those of lead, and so on for all known substances, and all the chemical elements. So, on a larger scale, every massive body has its period of vibration. A great suspension bridge vibrates, under the impulse of forces that are applied to it, in long periods. No company of soldiers ever crosses such a bridge without breaking step. If they tramped together, and were followed by other companies keeping the same time with their feet, after a while the vibrations of the bridge would become so great and destructive that it would fall in pieces. So any structure, if its vibration rate is known, could easily be destroyed by a force applied to it in such a way that it should simply increase the swing of those vibrations up to the point of destruction. Now Mr. Edison had been able to ascertain the vibratory swing of many well-known substances, and to produce, by means of the instrument which he had contrived, pulsations in the ether which were completely under his control, and which could be made long or short, quick or slow, at his will. He could run through the whole gamut from the slow vibrations of sound in air up to the four hundred and twenty-five millions of millions of vibrations per second of the ultra red rays. Having obtained an instrument of such power, it only remained to concentrate its energy upon a given object in order that the atoms composing that object should be set into violent undulation, sufficient to burst it asunder and to scatter its molecules broadcast. This the inventor effected by the simplest means in the world—simply a parabolic reflector by which the destructive waves could be sent like a beam of light, but invisible, in any direction and focused upon any desired point. I had the good fortune to be present when this powerful engine of destruction was submitted to its first test. We had gone upon the roof of Mr. Edison's laboratory and the inventor held the little instrument, with its attached mirror, in his hand. We looked about for some object on which to try its powers. On a bare limb of a tree not far away, for it was late in the Fall, sat a disconsolate crow. "Good," said Mr. Edison, "that will do." He touched a button at the side of the instrument and a soft, whirring noise was heard. "Feathers," said Mr. Edison, "have a vibration period of three hundred and eighty-six million per second." "That looks bad for the Martians, doesn't it?" said the Wizard. "I have ascertained the vibration rate of all the materials of which their war engines whose remains we have collected together are composed. They can be shattered into nothingness in the fraction of a second. Even if the vibration period were not known, it could quickly be hit upon by simply running through the gamut." "Hurrah!" cried one of the onlookers. "We have met the Martians and they are ours." 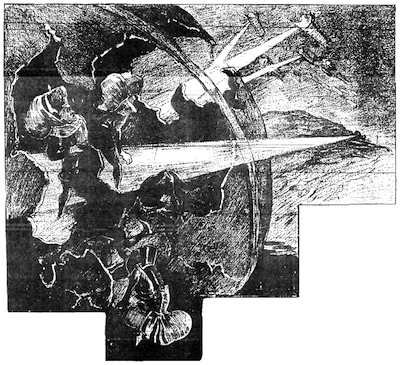 From Edison's Conquest of Mars, by Garrett P. Serviss.